Worthington is a privately owned, ISO9001 Certified primary producer of purified enzymes, proteins and nucleic acids for biotech and life science research, diagnostic, biopharmaceutical and bioprocessing applications under GMP guidelines. Our reputation for producing quality products for life science applications is the result of over 70 years of experience. In-house, full-service capabilities include initial extraction, fermentation, protein purification, and lyophilization to meet the demanding needs of the diagnostic reagent manufacturer. All animal-based raw materials supplied to Worthington are obtained from United States Department of Agriculture (USDA) approved facilities, inspected and certified to be healthy, free of disease and suitable for human consumption and/or exportation. All slaughtered animals are given ante and post-mortem inspections and those that are found to be wholesome are passed for human consumption. 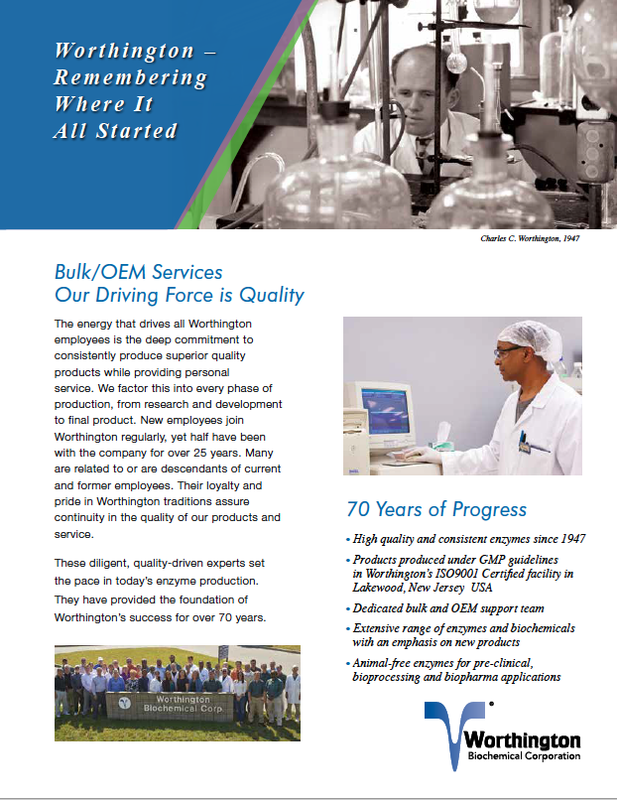 All manufacturing and purification takes place at Worthington’s facilities located in Lakewood, New Jersey, USA. An Animal Products Material Certification can be provided by Worthington if required along with copies of raw material suppliers’ certifications. Several animal free (AF) enzymes are also produced and pending development by Worthington as an alternative to animal sourced products, thereby eliminating TSE/BSE and mammalian viral contaminant risks. We welcome the opportunity to discuss specific requirements and collaborative development projects. Worthington will be exhibiting at the Clinical Chemistry (AACC), EB, ASCB and other meetings and welcomes you to come by our booth.